The 1986–87 NHL season was the 70th season of the National Hockey League. Twenty-one teams each played 80 games. 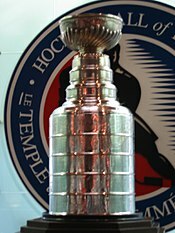 The Edmonton Oilers won the Stanley Cup by beating the Philadelphia Flyers four games to three in the Cup finals. This page was last changed on 9 March 2013, at 14:54.